When it comes to making home energy upgrades feasible financially, ensuring that homeowners understand their financing options is important for converting interest into action. Financing, however, can be a complicated topic, and many programs struggle with communicating its value. Many Better Buildings Neighborhood Program partners found success by speaking about financing in ways that resonate with homeowners. Many successful programs have refined their financing messages, focusing on those that convey long-term value, low monthly payments, and low interest rates. Following are a few examples of how programs have effectively communicated the value of financing energy upgrades in ways that resonated with homeowners. In just three years (as of October 2013), the Keystone Home Energy Loan Program (Keystone HELP) had provided more than $100 million in financing for energy improvements to over 11,000 Pennsylvania homeowners. Keystone HELP found that messages about “low monthly payments” and “no money down” were most effective to help drive loan uptake, as was the idea that homeowners would not encounter any surprises down the road. 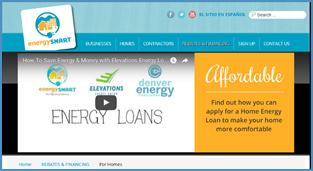 According to its website, “Keystone HELP offers True Fixed Rate Financing, which means the rate of your loan will never change, and your low monthly payment will stay the same for the life of your loan.” This gave homeowners confidence that their monthly payments would be stable, further encouraging them to invest in energy efficiency improvements. Enhabit’s home energy upgrade messaging focuses on affordability and home transformation, comfort, health, and proven results. Formerly known as Clean Energy Works Oregon (CEWO), the program successfully paired these non-energy benefits with promotions for its no-money-down financing options to homeowners using specific examples. CEWO’s website included statements such as, “It has never been more affordable to transform your home from vintage looker to cutting-edge performer;” and “Hundreds of other homeowners have already financed a CEWO Home Energy Remodel, with costs ranging from $2,000 and $30,000 and an average just over $10,000. In most cases the money they save helps offset a nice chunk of the monthly loan payment.” By coupling its messaging with a simplified loan process and sample estimates of monthly loan costs and expected energy savings, the program helped homeowners make informed decisions about how an upgrade would affect their monthly cash flow. From 2011 through 2013, Enhabit and its lending partner completed more than 2,600 loans valued at $33.4 million. Boulder County, Colorado’s EnergySmart program explained how homeowners could combine its loan options with available rebates to finance energy upgrades for a more efficient, comfortable, and affordable home. By streamlining its financing messages and the loan process, EnergySmart issued more than $1.7 million in loans between August 2012 when the loan product became available and September 2013, helping 150 homes and businesses overcome cost barriers to energy upgrades. Discover more financing lessons learned by visiting the Better Buildings Residential Solution Center Financing –Deliver Program handbook for step-by-step guidance and program examples.